At St Joseph’s we are committed to the engaging delivery of mathematics across the age ranges and curriculum. 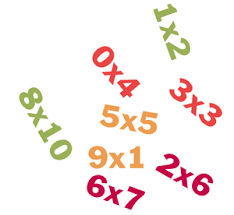 For children to access the majority of their learning in mathematics, a strong and confident grasp of the four number operations is important; using formal and informal written methods and mental strategies. We use concrete apparatus such as Numicon and pictorial representations to develop deep, conceptual understanding of mathematical ideas. We use talk partners which encourages children to discuss their mathematical concepts. The school has recently been subscribed to an online maths system called MyMaths.co.uk. It will enable your child's classteacher to set online homework tasks by and can also be used in lessons. It has a wealth of fun mathematical activities to engage the children with maths, there are online lessons, games and online homework tasks. All of the children from Year 1 to Year 6 have now been given a personal login number and password to access MyMaths at home. There is a 'How to Guide' attached below if you should require any support accessing the activities, we hope you enjoy using the site. What a wonderful day of number focussed activities there were taking place throughout the school on the NSPCC Number Day whilst at the same time raising money for a charity devoted to helping children. The total raised an amazing £95.63. The children were invited to ‘dress for digits’ to highlight numbers. It was great to see walking dice, calculators and number themed tops – numbers everywhere! Class 1 had a musical number time and made yummy cakes that were sold at the end of the day. Class 2 and 3 challenged each other in a number focussed quiz. Class 3 measured and measured some more! Year 5 children took part in a ‘Battle of the Robots’. Year 6 children worked throughout the school helping with activities and highlighting how much fun number work is. Take a look each of the class pages to see more about this event. RAINBOW MATHS takes place everyday at St Joseph’s. Children in all classes look forward to completing their daily challenge. The task is to complete a given amount of questions in a certain amount of time. The purpose of Rainbow maths is to improve children’s rapid recall of the four operations (+ - x ÷) when applied to basic mathematical questions. Everyone starts at the lowest part of the scale. When a child can successfully answer all questions within the timescale with no more than the accepted number of mistakes, every day for a week, then they can move up a colour. When they get to the end of the stages they can either go on to the next group of stages or restart depending on the focus of learning (addition, subtraction, multiplication, division).